So I have recently been toying around with the one arm military press. I train shoulders twice per week and I now include heavy one arm military presses every other shoulder workout. This started by accident a little over a month ago. I was planning to do some seated dumbbell military presses, but all the benches were taken. I grabbed a set of dumbbells and decided to do just one arm at a time standing (an exercise I’ve never included as part of my routine). It felt pretty awkward the first set, but really engaged my triceps. By the 3rd set I was hooked! This creates a much different feel in the shoulders than doing seated dumbbell presses. After just 4-5 weeks of using this lift all of my weights in my pressing movements have shot up. No wonder this was such a popular exercise back in the early 1900’s. The seated dumbbell press has been a long time favorite lift of mine for the shoulders. There is a challenge with this lift however and it is getting the dumbbells into place. I can comfortably get 50-60 pounds up to the starting position, but much past that is a decent effort. Because of this I haven’t progressed much past 60 pounds for reps. The one arm military press is a different deal. It is really easy to get the weight in place. I have no problem cleaning a single 90+ pound dumbbell to shoulder height (not that I will be pressing this any time soon). I have a feeling I will be well into the 70’s and 80’s within a month or two. Last week I was doing multiple sets of triples with heavier weights than normal. It was really fun. I would perform 3 reps with one arm, put the weight on the floor…then do 3 reps with the other arm. I started with 50 pounds and worked my way down the rack. Each time I grabbed a heavier weight, I would put the weight on the ground and psych myself up before each set. This lift is an interesting one, because the right mindset makes all the difference in the world. I found an excellent article reprint by Sig Klein from 1937. It is appropriately titled The One Arm Military Press. Sig makes a great point in this article about how to “make the body rigid” before pressing the weight overhead. So irradiation is basically the ability to improve the strength of a muscle by tensing the surrounding muscles around that muscle. Soviet Special forces trainer Pavel Tsatsouline talked about this in great detail in Power to the People. I always like to use Pavel’s exact example, because he explains it brilliantly. The second workout I did with one arm military presses, I was struggling a bit to get 60 pounds moving. Then I decided to use irradiation in my favor. I first make a fist with the arm I wasn’t using, let that tension increase across my body and when it hit the side I was lifting with…I tightened my grip on the dumbbell and easily lifted it overhead. Now I simultaneously do this while also tightening my abs. I haven’t tried flexing the legs yet, but I am guessing that will help me reach the next level. Who Is Going to Work Up to 90 Pounds In This Lift? There are probably a few here that are close. I am much better at pulling movements, but would love to work up to 90 pounds in this lift. If you can close in on lifting half of your body weight in this lift, while at a low body fat percentage…I pretty much guarantee that you will have amazing definition in your shoulders and triceps. Anyone close to this level yet? Wow I never thought about this lift. This is definitely going into my next workout! I’ll have to give that a shot. It looks challenging. Several months ago I had elbow surgery and could only work out my left side for a while. I did some dumbbell bench presses with just one arm and couldn’t believe how much more difficult it was. It worked the stabilizing muscles of my core more than any ab exercise would. I think it’s easy to get into a rut of doing traditional exercises so I’m always interested when someone brings up a new variation like the one armed military press. Thanks. Just what the Dr. ordered…. It’s cooling off in Florida so I have been running a lot lately and yes, have pretty much lost my shoulders. Also lost most of my but. I’m going to have to go heavy on One Arm Military Press and squats to offset. 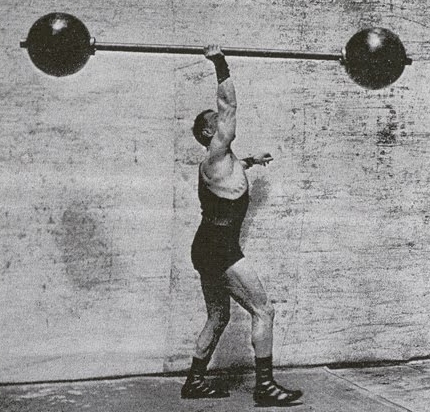 These old-school lifters definitely knew what to focus on to get the best strength gains! I work out primarily with kettlebells these days, and the clean and press is one lift I do at least once per week. Not using a 90-lb’er yet, but I’m happy with where I’m at nonetheless! Hey, awesome article. I’ve been following your posts for a few months now and your advice is top notch. I’ve a achieve levels of definition I never thought I’d see. That said, I still have a ways to go to reach my goal. But can’t wait to try this press! Thanks for all the good info, keep it up man! One arm military press is awesome. When doing it standing abs will get a good stability workout too. I often grab two Dumbbells and go for alternating presses. Awesome shoulder workout which allows for a bit of momentum…. Wow excellent idea! I never even thought of this before (stupid me) I have been trying to press 2 x 60 lbs dumb bells and nearly fall over backwards trying to get them up or tI use so much energy in trying to get them both up I don’t have any left for the exercise …. this is a great way to keep on progressing. I love working shoulders and I am a big fan of these. No where near the 90 pound mark yet but just under the level you mention. I also like to do a arnie press as a one arm standing lift as well. Don’t know about you but I have one stronger side than the other so doing barbell work was not helping the situation. By doing the shoulders separately I have been able to focus more on the weaker side and I am almost at the same level for each side now. Will try the irradiation techniques you highlighted as I have been using a more explosive lifting method. Another reason I like this move is that my abs feel like there getting a great workout as well. One thing I learned about from your blog Rusty is the idea of irradiation. It’s a very cool concept that can really be applied with a ton of workouts. Those are tough. I’ve done 90lbs on the side press (this is the lift Pavel talks about in the book). Bent press – weight stays but you “drop sideways” to straighten the arm. I used to have an adjustable dumbbell going up to 40 kilos and would train daily. I soon reached the max weight, but as I locked out in a 42kg PR, my dumbbell fell apart, weights crashing inches from my head…. So for a while I backed off from the lift and gave my dumbbell away. This is really interesting. I’m not advanced enough to do the one-handed press yet. It says a lot when I’m still only aiming for a 50kg Military. This is my weakest barbell exercise and I perform better in even my chin-ups. That’s why I probably won’t try this out until I can handle a decent amount of weight. Your blog posts of late smack of Pavel’s teachings. Have you been reading the Evil Russian’s work? A great variation is to use a curl bar or straight bar (as in your picture), and the exercise is now called a javelin press. This will work your core stabalizers on the sides, and is a fantastic exercise. Not bragging Rusty, but I’m already over 90lb dumbbells. Been working on these for the year- been incorporating them into a body-by-science type workout, training them once a week, and loving them. They’re one of my favorite exercises to show friends to do when they ask for training advice. This is funny, I started using the One Arm Military Press a few weeks. It helps to correct any imbalances in the shoulder, as each shoulder is forced to do all the work without the dominant one kicking in and picking up the slack of the weaker one. I love the language Sig uses, he gets his point across, but in an old timey manner, lol. Another awesome post. This is a little off topic…but I would like to know what you think of teens and resistance training (bodyweight, resistance bands, free weights) and how much should I be eating. I’ve been told I need to eat more since teens are “growing” but I just don’t know what to believe. If you could please clarify it would be very helpful. Hey Rusty I really want you to write more articles for all the women out their!!PLEASE!!!!!!! Definitely a great lift, and the best thing is how fast you can increase weight/strength while still maintaining form! Awesome! Do it with a barbell like josh said (one handed javelin) and you look like a BADASS! Great stuff Rusty, as usual! Awesome exercise Rusty! I love standing barbell shoulder press but never really thought about doing a one arm version. Definitely something I will consider adding to my routine. 90lbs might happen…10 years from now! Thanks for another great strength training exercise. I love the old school workouts. And, working one arm at a time provides a great core workout. I’m with Darrin, living here in south FL I spend a lot of time walking or running on the beach and that does nothing for the shoulders. I glad you put this post up Rusty I was looking for something to build my back and shoulders up. This looks great for should now I need that killer back workout. I don’t know about too many squats though Darrin as my thighs bulk up quickly so I might just stick with lunges and running in the sand. The one arm press is the backbone of Pavel’s kettlebell program. In order to complete his “Rite of Passage”, you must be able to clean and strictly one arm press (no legs) half your bodyweight with a kettlebell. I’ve done 80 lbs at 162 lbs BW. I find these easier than two hand military presses. I’m close to a BW military press. In Pavel’s opinion, the one arm press in the only upper body work most people need. Try his one arm press workout paired with weighted pullups. It’s a killer. I have been doing some kettlebell work recently and been doing some one arm cleans and snatches. I really like doing one arm training. It seems to engage your core a lot more than when you have both dumbells to stabilize and balance you out. 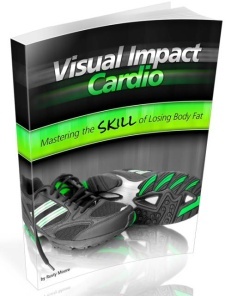 I just bought Pavel’s book on Kettlebells after learning about him from you. This guy is a wealth of knowledge! I like him because he is a no nonsense, just get to work, kind of guy. 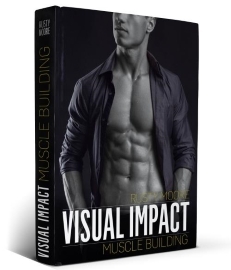 I love reading how the weightlifters trained in the 18-1900’s they really took a whole body and strength approach rather than working the mirror muscles, a great read thanks! I adjusted my hand position and went for a thrusting push into the air. I thought my core on the right side, near my lats, was up to par. It wasn’t, and I strained the muscle. HOWEVER, I did get my weight up to 70lbs for 2 reps, and focused on Irradiation. Now, I’m icing… but I’ll be back, and I’ll hit that 90lbs. I like the idea of one arm military presses, what do you think doing them using the barbell on the smith machine? Also I think arnold presses done with proper form are agood exercise for the shoulders. These are one of those lifts that i really need to practice. I am really weak at these. I like the idea of irradiation, so will be looking at applying it in my workouts. I would appreciate it if you have time to visit my blog too, its a new blog, so nothing special yet.. I have never tried this lift either. I will definitely add it to my routine, but I doubt I will be close to 90 lbs. Based on my standard military press numbers, I would be surprised if I could hoist 40lbs! I’ll keep the reps low and psych myself up! Hey Rusty, great website and tips are awesome. Can you please sometime do posts that can benefits us ladies as well? Many thanks, keep it up! Great post. I use to do the one arm press with an Olympic bar. To make it easier to get to the shoulder I would just do it in a power rack, worked well. The long bar makes it much more difficult and less weigh is involved so it is done more for reps. Great exercise. I just don’t get it. I have weaker triceps, my shoulders are not that wide (though thick) but with thick bar training I was able to get to 70 pound kettlebell one-arm press a few months ago (for 1 rep) while I weigh 165 pounds myself. And strangly I almost never perform seated presses – always standing with the initial clean from the floorfoolowing the irradiation principle. The only issue with heavy low rep military press I’ve been having lately is thickening of the obliques. 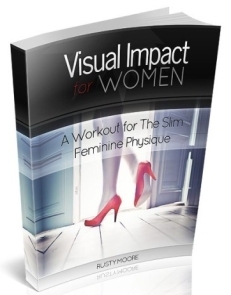 It’s hard to tell how much of a different and sexier look you have when you have slim waist! Though, one arm dumbbell press seem to be worth trying for me because of the tricep trashing. Thanks. So should I lose the standard military press and add one arm military press? or just do them both one after another? so how is the pressing movement performed? do you have the back of your hand facing outwards and just press or do you turn as you press up kind of like arnold press? I love your blog and I second the request for articles for women. Here’s my question, and I think this might be one a lot of people would have. I’m about 15lb overweight, incredibly unfit. So I’ve gone down to a 800-1000calorie diet focusing on paleo-style foods and a protein shake for lunch. I’m starting upper body weight training and trying that crazy8-circuit (though I can only do one rep, modified!) followed by some steady state cardio (zumba). I plan on increasing my reps and cardio time as I get fitter. Am I on the right track or should I do anything else? Have been reading up on other comments and your responses and you seem to say that by strength training your weight will naturally increase a bit? I’ve tried the strength training + calorie deficit routine and it worked pretty well in leaning me out but, even though i know that bulking up hasnt really worked for me in the past, it seems that strength training alone wont help me see an increase in weight unless i’m in a calorie surplus? my stats: 6ft2 and around 170lbs (though weighing myself seems to do me more harm than good because it makes me think i’m still too thin even though i look better know than when i was puffy and ‘bulking up’) – trying to get that extra bit of vascularity so easing off the cals once again whilst keeping up the weight training and have started interval running again. I’m hoping your shrink wrap technique is really going to work! I love this workout. It’s so simple yet so effective. Now, I eat this everyday since I have no sense of taste nor smell, so food is not important. On my fasting days I just eat the dinner which is about 800 calories. For working out (6 days a week) I do daily: the Crazy 8, a work out with ISO 7X (which is awesome btw), the Tabitha Protocol (for cardio…just google it, and yest it is awesome)and for weights I am on Phase II of Rusty’s program. I have not lost any weight, none. Prior to doing the fasting I was working out (w/o the Crazy 8s and Rusty’s program)and still eating the same and I can not drop from 190!!! (I am at 193 right now) and i don’t even have a 4 pack! I am doing the excercises right, I am eating right, I am fasting right…so something is not working out here, which must be the amount of calories that I am taking. How many calories should a person eat per day? I hope you guys can shed some light into my dilema. Not yet, but I’m on my way! I’m around your strength level. I’ve been pulling alot lately to even out my muscularure. Hey Demond! I too had elbow (lateral epicondil) surgery. One year later, I’m up to 75lbs for one rep, and ice after the workout. On training days, I avoid the ibuprofen because it interferes with GH levels, but if needed, I take it on non training days. I also keep my blood ph high to avoid acidic levels – it interferes with healing. I do this by eating a lot of raw spinach and broccoli. Great article. We forget about the old school stuff, yet it is all tried and true! I also like going one arm press with incline. Use your empty hand to steady your body. Start with the weight supinated beside your chest and then alternate on the way up!! Great post on this simple exercise. I mean, what is a better test of strength than being able to lift and then press a heavy weight over your head? 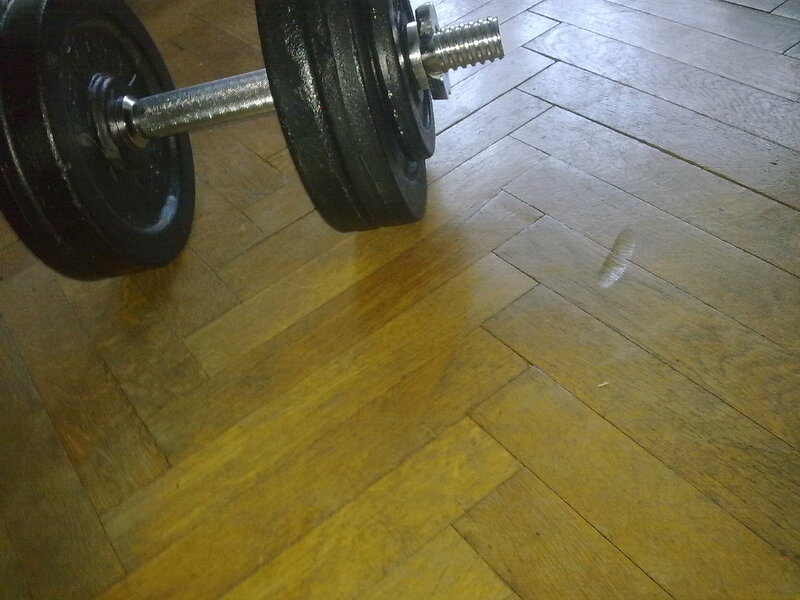 Along these same lines, I really enjoy doing sandbag clean and presses. The weight is unstable and hard to lift, and requires all sorts of core stabilization in addition to being extremely taxing on the shoulders and triceps. That’s a cool photo! I should imagine this would build some decent core stability in addition to the obvious muscles. I am still trying to figure out how to perform these properly. I looked on youtube and the web and can’t find much. I would rather see someone doing them instead of words telling you how to do it. does anyone know where i could go to see how to perform them. I totally agree! If you need more articles for women check out my page: http://allofashleysanswers.blogspot.com/ I really like this one too. This image is just astounding though! Rusty, this is right on. I’ve tried to go for volume with these, multiple sets of 4. Unfortunately I noticed my shoulders start to suffer slight injuries, that I only afterwards when moving them at specific angles or along specific planes. I can testify to the strength building power of these one arm standing presses, but for the life of me I’ve not been able to figure out which movement, exactly, is causing me injuries. Basically I clean the dumbells to my shoulder, then press with a contraction of my back obliques and abs. I might lower the weight and go for 3 rep sets for a while. Maybe there are weaker support muscles involved with certain stages of the movement that I need to build up. But yeah, these presses do build strength nicely. I’ve pressed an 88lb kettlebell with one hand at a bodyweight around 152lbs. My goal is to press 106lbs with one hand while staying under 160lbs. Awesome exercise, will really help building those delts! Hey Rusty, I am 205lbs and can get a few reps at 90. Have gone as high as 100lbs. Doing a strict military press is much easier as i can do well over double the weight as I can with one arm. Great exercise. I got rid of seated DB presses a long time ago. I found out that standing up and using one arm at a time develops a lot more muscles than just the shoulders. I think that any move you can do standing up is much more preferential than the seated variety. hey Rusty, I was getting frustrated with my progress in shoulder press so I started adding the one arm military press to my workouts. You weren’t kidding! After about 3 weeks my shoulder presses really started to improve and I haven’t stopped making gains since…of course, I have a long way to go before I use 90lb dumbbells. I really need to start building in some one arm military presses to improve my overhead press strength. Do you shrug or raise your shoulders at the top like Rippetoe suggests, or ‘pack’ them as Pavel advises? It helped my bench tremendously, I really enjoy doing them. Not often but at least 3-4 times a year for about 3 weeks. Never tried the one armed press. Will have to look into it. Currently I can press both 70lbs DBs 6 times. Thanks for this great article. It helped me find a solution to my problem: I decided to give up handstand pushups after 2+ yrs of them because I fear that straining while upside down is not so good for the blood vessels in the brain and eyeballs of a 46 yr old. But, the HSPs made me so much stronger doing only 5 per day. So I needed a good substitute in my routine and the 1 arm press is it, thanks to your article. I do 90 lb on side press and will progress to 100 lb soon. I do C&P too (“Sig Klein Challenge”), but the 1-arm side press is just so cool and seems to work not only delts but also lat, pec, trap and- of course-tricep. Thanks. I think that any move you can do standing up is much more preferential than the seated variety. What is the correct way to press one armed ? I read this article and the one that is linked in the article and neither explains that. So should i use neutral grip and keep the elbow in front of my body, or should the palm face away from me, to my front, and should the elbow be on the side of my body (90 degree angle). If you could reply to this it would be great :). Thank you. Next post: Madonna’s Gym, “Hard Candy Fitness”, Coming to a City Near You?